Definition: Enterprise Resource Planning, or otherwise known as ERP is an integrated software application, which firms use to manage and control their internal and external resources comprising financial resources, material, assets and human resources. Put simply, ERP system unites various functions of management into a rationally integrated system to streamline processes and enable the movement of information among all business function. It can be understood as a description of systems wherein innovative information technology is used to manage all functional areas in an organization. The key characteristic of an ERP software is shared database, which supports some functions, used by various business divisions, units or departments. There are real-time reporting and automation in this system, to a certain degree. Moreover, it is featured with the dashboard to facilitate employees know the business performance on key metrics quickly. The general features of ERP help to combine all areas of the business into one system so as to enable every element of the manufacturing process. The system modules encompass features for customer relationship management, accounting, human resources, manufacturing management, etc. Need Assessment: First and foremost the company’s needs are to be identified properly. The process begins with searching and documenting important business processes, inflection points and KPI, i.e. Key performance indicators so as to outline perfect ERP solutions. Hire a team of specialists: Next, in the process of implementation, experience professionals or experts are hired or contracted so as to direct the organization through the implementation process. ERP system evaluation and selection: The choice of right ERP software is the most difficult task in the entire process, which depends on various factors like business needs, industry type, preferences and so on. Prepare for Change: Implementation of ERP throughout the organization is one of the biggest change, and that too when the company is not used to such system. So, make sure that the management, staff and other members are ready for such a change. Data Preparation: All the data cannot be converted into the new system. So analysis data should be analyzed and ascertain the pieces of data which are required to be converted. Once the data is entered in the system, it should be cleaned up properly. 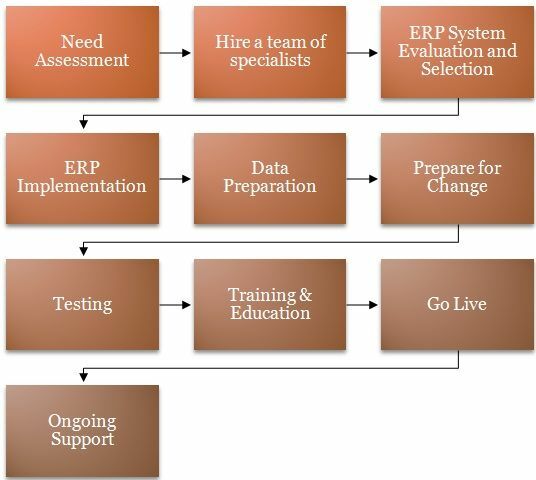 ERP Implementation: Once all the above steps are performed properly, then the ERP system is introduced. The ERP specialists design a particular plan for installing, configuring and optimizing the system for the working environment. Plans can be changed if required so the major business objectives and needs should be given preference. Testing: After implementation process is completed, testing is to be done, so as to ensure that work is performed in an intended way. Training & Education: When the system is properly launched in the organization and verified, the next step is to train and educate the employees regarding how to use the program. Go Live: Finally, when the system is configured, tested and employees are trained, then ERP program is activated. Ongoing Support: Continuous support about upgradation and maintenance is available to the customers, by the manufacturers, for better working. 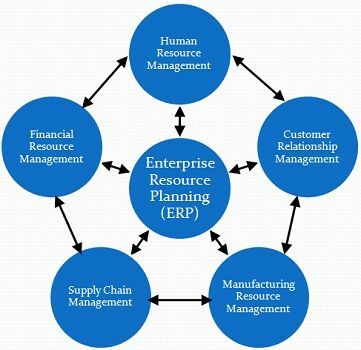 The ERP software is used by the firms to make optimum use of enterprise’s resources and maximize the economy, efficiency and effectiveness of the operations. The selection of ERP system is one of the toughest decision for managers, which is based on a number of factors like functional requirements of the organization, background of vendors, budget constraints and fund position and reports available in the package.